Zhen Chen inherited a family business specialising in the artistic industry of straw weaving and is now its President. They produce products such as hats and handbags combining traditional weaving technology with new techniques. The business called Zhejiang Copisoya Industry &Trade Co Ltd has been trading for more than three decades. However it is now when Zhen has had to fight the problems that this traditional industry faces, which are the aging of skilled workers, lack of innovation and the appearance of other independent brands. He said: “In order to deal with these problems we combine traditional weaving technology like handmade art, hand-painted art, inkjet art and bamboo art with new research. “We combine different types of technology to produce braided products with shape memory. For example, a hat can be folded into a bag and when you take it out the pressing force restores the shape. In recognition of his entrepreneurial efforts, Zhen was shortlisted in 2017 in the 12th Chunhui Cup, an entrepreneurship competition organised by the Chinese National Ministry of Education. In 2018 he was selected as ‘Taizhou 500 Elite’ and ‘Leading Talent of South Taihu Lake of China’. 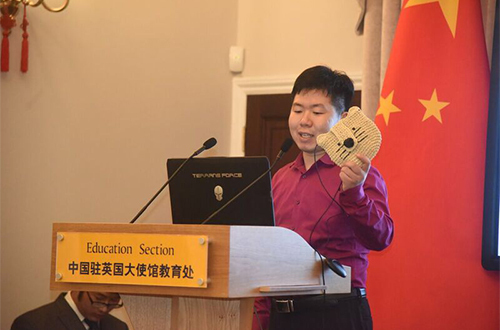 More recently, in September 2018 he won the third prize at the Chinese Embassy in London where eight students were selected as the best venture representatives for the ‘2018 CSSA-UK 30th Anniversary High-level Entrepreneurship Challenge’. Going forward, Zhen has got big plans for his business. He explained: “Our Company has joined a number of colleges and universities to turn waste (industrial refuse) into wealth, which reduces production costs significantly and increases profit margins. Some of the products Zhejiang Copisoya Industry&Trade Co Ltd produces.